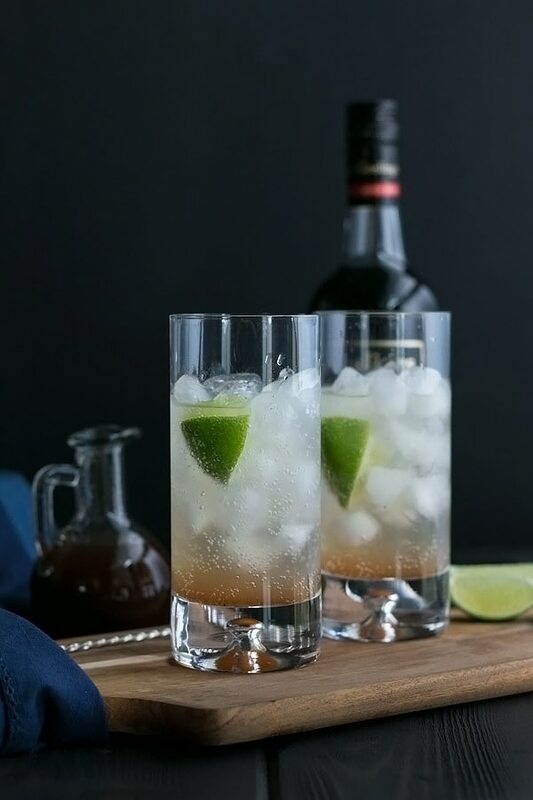 This is a classic dark and stormy cocktail with a delicious Cooks with Cocktails twist. This gorgeous cocktail from Bermuda is made extra special with a spiced simple syrup that creates layers of flavor that will have your taste buds dancing. The secret is that its really easy to make and the layers are even easier to create. 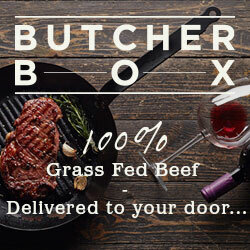 Stick with us and we will show you how. 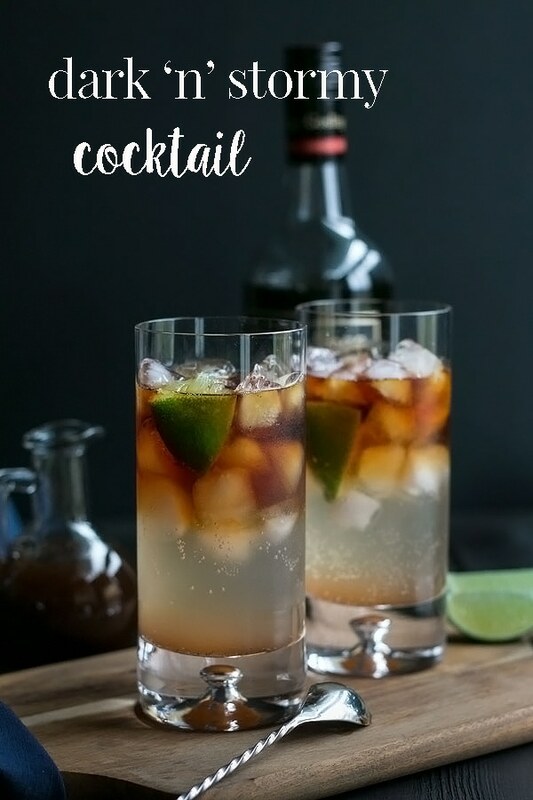 The dark and stormy cocktail has a long history that dates back to the late 1800’s! It is one of the true old classic cocktails and its making a come back for a good reason. Its dang good! The dark and stormy originated in Bermuda where the Goslings family made a special rum and the British sailors made ginger beer. Apparently they started brewing ginger beer to combat sea sickness and to try to keep the sailors off the grog. Eventually the rum and the ginger beer was combined in one glass and because it was so delicious, the flavor combination stuck around. 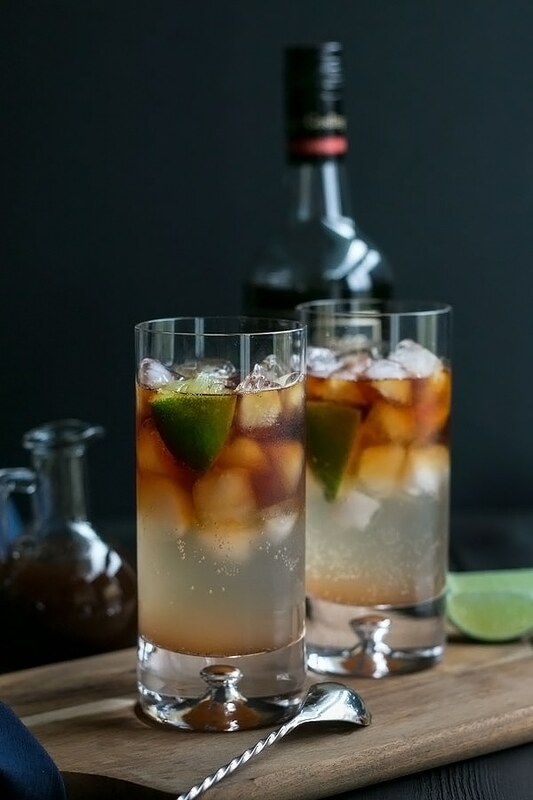 According to a legend, the cocktail got its famous name from a WWI soldier who said that it was the “color of a cloud only a fool or a dead man would sail under.” Hence, the Dark and Stormy. 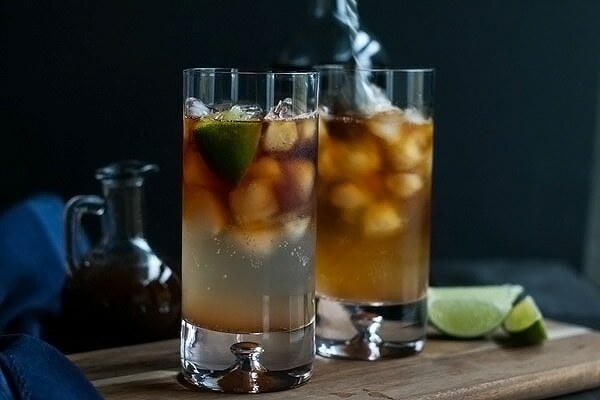 A classic dark and story cocktail is made with 2 oz of Goslings Black Seal Rum and 3 – 4 oz of fizzy ginger beer. 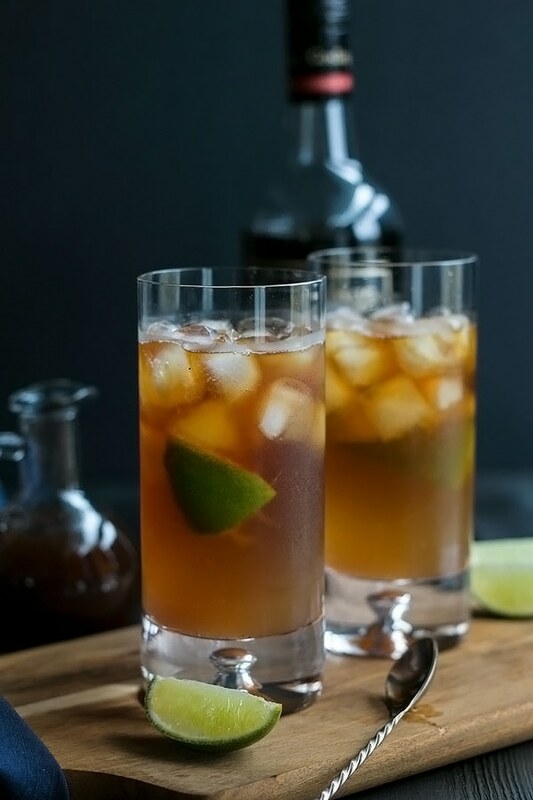 This is a recipe that the Goslings family is fiercely protective of and have gone so far as to trademark the recipe so that to have a true dark and stormy cocktail, it MUST be made with the proper rum. We have followed the rules in our cocktail in that we have used the Goslings rum and ginger beer, however we veered off the straight and narrow and added a spiced syrup that just enhances the flavors of both the rum and the ginger beer and it makes this cocktail all the more special. Our syrup is full of spice! 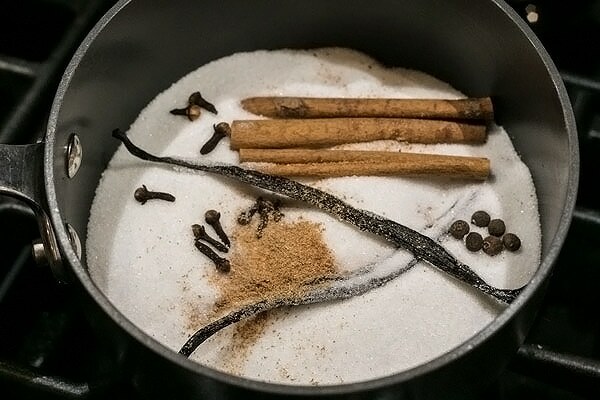 Vanilla, cinnamon, all spice, nutmeg, ginger, clove, and lime to brighten it all up. Its simmered together in a pot with water and sugar until it becomes all syrupy and fragrant. Then its strained and set aside to cool. hold a spoon upside down at the top of the glass just above where the ginger beer layer starts. Pour the rum slowly over the spoon and watch the rum float on top. This is where the magic happens! You end up with a three layer cocktail that looks so impressive, it will knock the socks off of whoever you make it for! 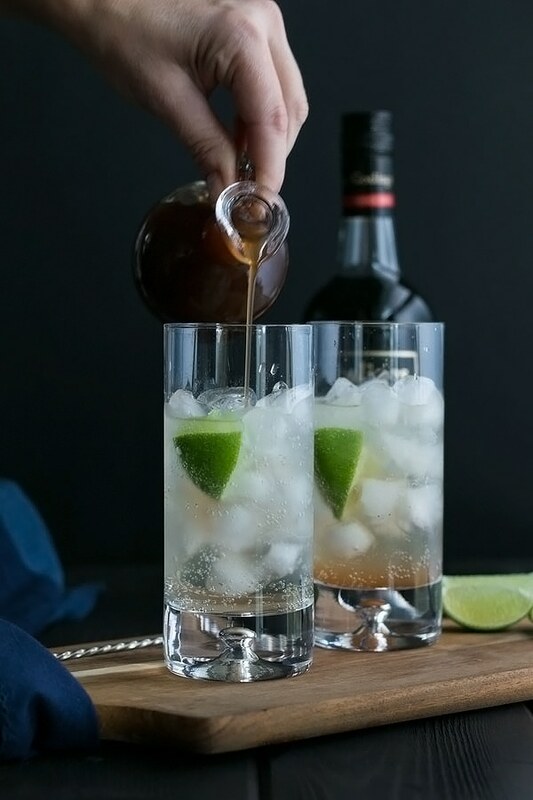 We used Fentimans ginger beer for this dark and stormy cocktail, but you can use whatever ginger beer you like. Just be careful as some ginger beers have a LOT of sugar in them and they will be too sweet for this cocktail. Choose one that has less than 20 g of sugar on the nutrition label. Less is better. Give it a stir before you drink it! 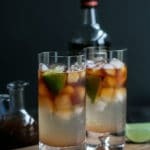 Goslings Black Seal Rum – you cant have a proper dark and stormy cocktail without it! You can find it in most liquor stores. tall highball or collins glasses – these are gorgeous glasses. We love how they show the layers of the cocktail perfectly. Add the sugar, water, and spices to a pot and bring it to a simmer over medium heat. When it starts to simmer, turn the heat down to low and keep simmering for 10 - 15 mins or until the mixture starts to thicken and coats the back of a spoon. Take it off the heat and let it cool. When it has cooled a little, strain the syrup and discard the spices. Store the syrup in a jar or container until you are ready to use it. Store it in the fridge if it will be longer than a day. Add some ice to a tall cocktail glass. First add the ginger beer, then pour in the spiced syrup. It should sink to the bottom. Hold a spoon upside down at the top of the glass, just touching the top of the ginger beer. Pour the rum over the spoon slowly and the rum will stay at the top and create a rum layer. Serve in layers, but stir before drinking.